When we think about saving energy in the home, we generally focus on the obvious energy uses: heating, cooling, water heating, refrigerators, and so on — energy uses and products that the bulk of this site addresses. In many homes, though, there are miscellaneous uses of energy large and small that are for the most part overlooked. We’ve already discussed some of these in the section on home electronics. Some of the larger energy users are waterbed heaters, well-water pumps, pool filtering systems, engine block heaters, hot tubs, or even aquariums for tropical fish. While the energy use of each of these products may be relatively small on a national level, it can be quite large in individual houses. In fact, if you have one of these miscellaneous products, you may find it accounts for more energy use than your refrigerator, water heater, or even heating system. Other common products, such as small kitchen appliances, rechargeable tools, and hard-wired loads (doorbells, security systems, garage door openers), use relatively small amounts of energy on an individual basis but consume a lot of electricity overall, due to their sheer numbers. And when these miscellaneous products are looked at collectively on a national level, their total energy consumption is significant — from 5% to 10% of residential electricity consumption — and growing. As you consider energy-saving opportunities in the home, look over this list. If you have a lot of these or other miscellaneous energy users in the home, there may be opportunities for savings. Recommendations are listed below for reducing the energy use of a few of these household products. Refer back to the section on heating systems. If your furnace is improperly sized, or if the fan thermostat is improperly set, the fan may operate longer than it needs to. If you’re getting a lot of cold air out of the warm-air registers after the furnace turns off, this may be the case. Along with making you uncomfortable, the fan is wasting energy. On the other hand, if the fan shuts off too soon, heat from the furnace will be wasted. Have a service technician check the fan thermostat setting if you’re unsure. Well pumps are common in rural areas. The amount of energy they use is dependent on how deep the well is, the quality of the pump, and the pressure controls. If the pump seems to be switching on more often than it should, there may be a leak in the system or the pressure switch may not be functioning properly. Have the system checked out. You can also save on well-pumping electricity costs by reducing your water use (see discussion on water conservation). The energy used to operate the cleaning and filtering equipment for a typical pool for one swimming season can equal the amount of energy used to power the average home for the same period. In Sunbelt states, pool pumps can account for 25-30% of home electricity use! Many pool pumps are oversized; installing a variable-speed replacement pump can save 50-75% of pumping energy use. These pumps run much more efficiently than traditional pumps and can be programmed to run at an optimal (typically slower) flow rate to increase energy savings and improve the performance and life of your filtration system. Modifications to the plumbing layout at the pool equipment pad can create additional energy savings. Look for opportunities to replace hard angle pipe connections with sweep elbows, increase pipe size, and upgrade to low head-loss filters. Savings from a pool pump replacement and plumbing modifications can really add up! Until you’re able to upgrade your pool pump or make other modifications, try reducing the amount of time you filter the pool each day. You may be surprised how much you can cut filtering time without negatively impacting the water quality. Contact your utility to see if it offer rebates for efficient pool pumps. Pool heaters are also a big energy user, costing as much as $1,000 per year or more to operate depending on the type of heater and how often you use it. Heat pump and solar pool heaters can cut your pool heating bills dramatically compared to electric resistance or gas models. Pool covers can also save energy by reducing heat losses. Other benefits include reduced evaporative water loss, chemical use, and cleanup time. Your state or utility may offer incentives for the installation of solar or heat pump pool heaters. Spas and hot tubs can use a tremendous amount of energy. If you have one, keep it covered with a tight-fitting insulated cover when it’s not in use. If installing a spa or hot tub, insulate it well around the sides and bottom. Approximately 5% of homes have waterbeds; most are heated with electric coils running underneath the mattress. Waterbeds can be the largest electricity user in the home — exceeding even the refrigerator and water heater! Simple habits can significantly reduce energy waste from waterbeds. Regularly making the bed with a comforter can save more than 30%; insulating the sides of the bed can save over 10%. You might also consider putting the waterbed heater on a timer so that it doesn’t waste energy throughout the day. Each electric blanket in a house uses an average of 120 kWh per year. If you use an electric blanket and frequently forget to turn it off in the morning, you can save energy by buying a simple timer control. Putting a second blanket or quilt over the electric blanket also saves energy, but be sure to check the electric blanket’s instructions for possible precautions against this practice. Electric blankets may actually save energy by allowing you to turn your thermostat down further at night. If you live in a cold area and use a block heater to help your car start on cold mornings, you might be surprised at how much energy it draws. It is generally recommended that you plug in your vehicle for 2 to 3 hours prior to your departure time. Rather than plugging in the car before you turn in for the night, use a timer or install an extra circuit with a timer-controlled switch in the house, and plug in the car when you get home. Then set the timer for 2 to 3 hours before you need to leave in the morning. If you have an irregular schedule, consider using a power-saver cord. A power-saver cord uses a built-in thermostat to sense the temperature of the coolant in the engine. If the temperature drops below the setpoint, power from the block heater is allowed to flow to your engine, ensuring that your vehicle will always be ready to go. While each of these devices uses relatively little energy on its own, most homes have several (if not one or two dozen!) plugged in at all times. This can add up to $25, $50, or even $100 or more each year. At the national level, this means more than $1 billion in annual energy costs and the associated pollution emissions. Many of these items waste energy through inefficient power supplies and battery charging systems. Others incorporate clocks or other features that require a constant power draw, even if the feature is not used — how many clocks do you need in one kitchen? Unplug these products when they are not in use or when their batteries are fully charged. Saving energy with many of these incidental energy-consuming products — and with other products throughout the house — is very easy. Most of the time, it just takes some common sense. If we all become a little more aware of the energy we use, we might just begin to solve some of our major environmental problems, and we’ll end up with a little more money in our pockets as well. 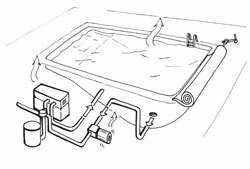 The pump, filter, and heater needed to operate your pool can use a lot of energy. Improve energy efficiency by installing a high-efficiency heater and pool pump, using a pool cover, and managing water temperature. For more tips on reducing the energy used to heat and filter your swimming pool, check out the Department of Energy's online consumer resources. Ready to buy a pool pump?